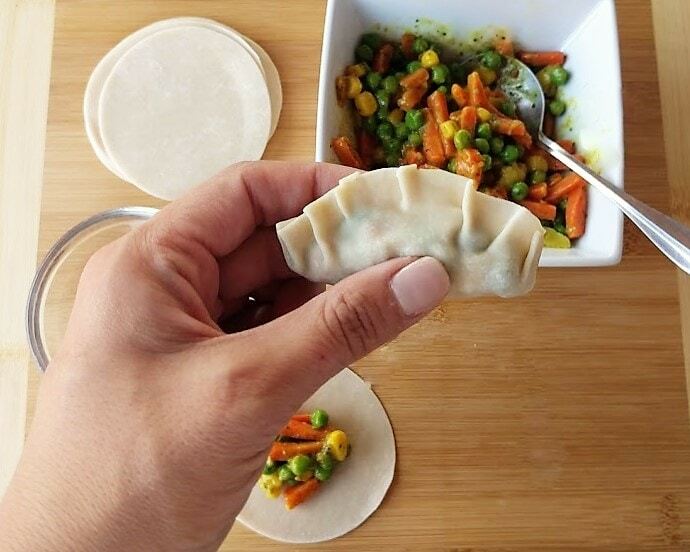 Potstickers filled with veggies and curry powder for a crispy bite that’s baked not fried! If I haven’t mentioned yet, I love bite size snacks or anything that doesn’t require a plate and utensils to eat. This is especially helpful when you’re trying to eat with one hand and holding a baby in the other. 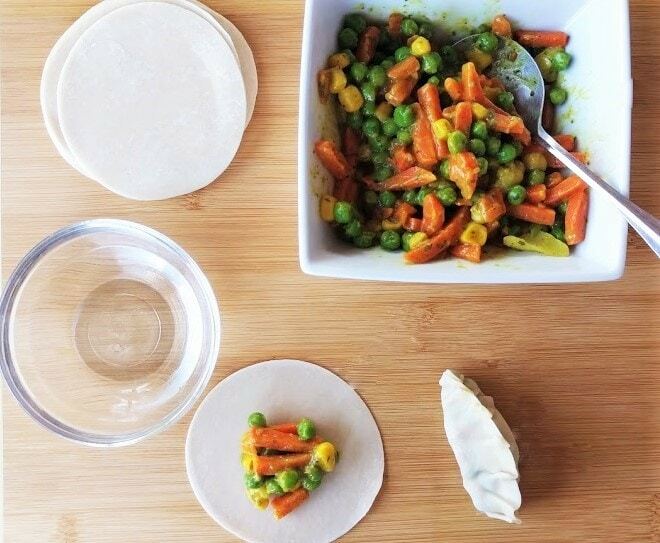 These potstickers are seasoned with curry powder and made with frozen mixed veggies, then baked to crispy perfection. They go perfect as an appetizer for dinner or they can be finger food for your next party. Traditionally potstickers are pan-fried in shallow oil, and these can be done that way, but out of laziness, I prefer to bake them. I just don’t like to mess with frying and having to clean the oil up later. Another plus is that they are healthier baked since you are using less oil. Wonton wrappers can be found in most grocery stores, so no need to make a trip to an Asian grocery store. If fresh wonton wrappers are available I would choose those over frozen ones. For the filling I just used a mixed vegetable medley and added some curry powder. The curry powder I used is the one they have in the spice section, which is mainly turmeric. You could also add diced cooked potato for the filling, but I was in a rush and wanted to keep it simple. To make the potstickers you’ll need to prepare the filling and let it cool. I just warmed 1 cup of the frozen veggies in a pan with a little oil and add a tsp of curry powder. Remove the wonton wrappers and have a small bowl of water which you’ll use to seal them. It’s easier if you assemble them on a cutting board. Place one of the wrappers on a cutting board and dip your finger in water and run it over the entire edge of the round wrapper. Then place about a teaspoon of the filling in the middle of the wrapper. Gently lift the bottom half and fold it over to make a half circle and press down to seal the edge. You can leave them like this or crimp the edges. To crimp the edges, start on the right edge and fold edge over towards the left. Keep doing this till you reach the opposite end. Once all your potstickers are made, place them with the edges up and flatten them on the bottom so they stand up. Spray your baking sheet with cooking oil, then spray each potsticker with cooking oil all around. Place them about an inch apart so they can get a nice crisp while baking. Place in a 375 degree oven and bake for 11-15 minutes or until the edges are browned. 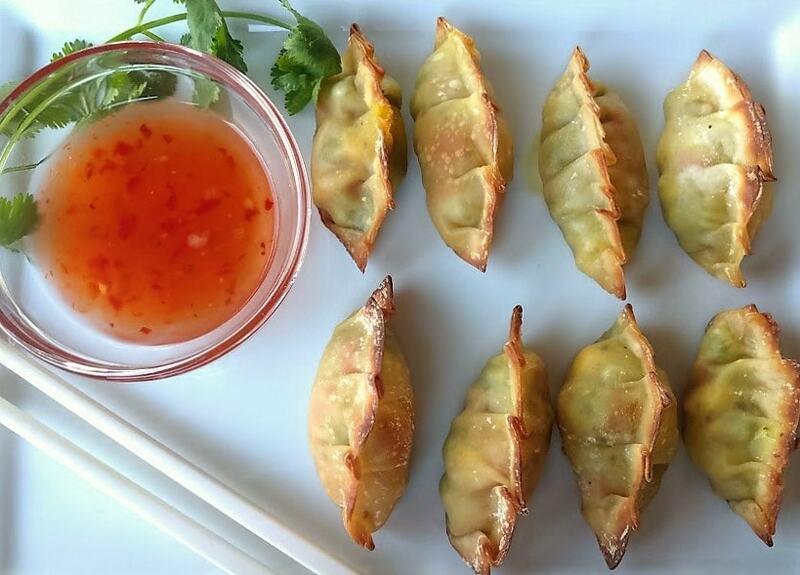 Serve with Thai sweet chili dipping sauce. Preheat oven to 375 degrees and spray a large baking sheet with cooking oil. Warm frozen veggies in a little oil and add a tsp of curry powder. Remove from heat and let cool. Remove the wonton wrappers and have a small bowl of water which you’ll use to seal them. It’s easier if you assemble them on a cutting board. Place one of the wrappers on a cutting board and dip your finger in water and run it over the entire edge of the round wrapper. Then place about a teaspoon of the filling in the middle of the wrapper. Gently lift the bottom half and fold it over to make a half circle and press down to seal the edge. You can leave them like this or crimp the edges. To crimp the edges, start on the right edge and fold edge over towards the left. Keep doing this till you reach the opposite end. 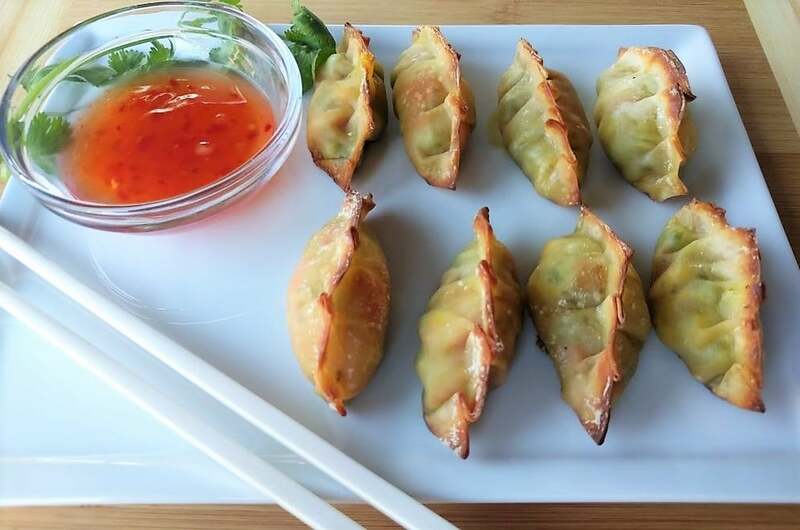 Place potstickers with edges up and flatten the bottom, then spray each one with cooking oil. Bake for 11-15 minutes or until edges are brown.